My five year old has officially been a kindergartner for about six months now. During the past six months he has met new friends, went on field trips, participated in parades, and even made his own flower diagram using pipe cleaners and poster board. Along with all of those fun experiences comes him having to do homework every single night as part of his after school routine. That’s right! For the past six months my kindergartner has had math and reading homework every night. I am not complaining at all because it amazes me to see how much he has learned. At the beginning of the school year we started off our after school routine a little rocky because he wasn’t used to having to do work after he got home when he was in preschool, so we had to make some adjustments to our after school routine for kindergarten. To be honest, I wasn’t used to it either. I had to figure out how to teach my child to focus on homework. For about the first month, or so, our after school routine consisted of picking my son up from school, then picking my other son up from daycare and we’d head home. I would take out his homework from his backpack and immediately had him sit to do his work. I’d let my youngest play his tablet or watch a little tv while I cooked dinner and got prepared for the rest of the evening. I noticed that my kindergartner got frustrated very easily and would say that he couldn’t do it (and my child very rarely says he CAN’T do something). Sometimes it even got to the point where he’d break down in tears. Yes, it got that bad and I couldn’t figure out how to help my child focus on homework without him having a nervous breakdown over it. One day after he had a little meltdown he told me that he gets distracted and couldn’t focus because my youngest is making too much noise along with the tablet or tv in the background. We talked about it and decided that it was best that we create a new after school routine that works better. I changed to bringing him home to do his work before I picked up his brother, so he could focus on school work at home. So, our after school routine changed to picking him up first, getting home and immediately sitting down at the desk to do homework, and then picking up his brother. This worked for about a good week or so before the meltdowns started happening again. He would still get distracted by daydreaming, playing with his pencil, or even asking me random questions like whether purple gummy bears taste like Lemonheads (that’s not really a question he asked, but you get the idea). At this point I was beyond frustrated myself. It would take him at least an hour to finish an assignment that would’ve taken a quarter of the time. How could I get my child to concentrate on schoolwork during our after school routine? Would I be able to find an effective after school homework routine and not have the whole process drawn out? I needed after school homework routine ideas that would help my child. One day it hit me plain as day! Our after school homework routine needed a little downtime for my son because he was physically and mentally exhausted from being in school. I’m almost forty so I forgot how it was to be five, getting up early, learning all day, playing with friends, and growing. Now we have the most effective after school homework routine for my kindergartner and it’s an after school routine that works! School and Daycare Pickup – It saves time and gas to pick them both up in one swoop. I pick my oldest up first since I drop him off first in the morning. That gives me a little alone time with him to talk about his day and see how he’s doing. Relax Time – After he puts his backpack away and uses the bathroom he has ten minutes to eat his snack, color, watch a little tv, or just lay around before he starts his work. It’s his choice. Homework Time – All electronics are off, except if I’m working on my pc. We all sit at the table together and work. That way I’m right beside him if he needs help or can’t fully read the directions. I give my youngest son pre-k worksheets since he’ll be starting next school year. Neither are a distraction to each other. I actually found that they encourage each other more when they’re working side-by-side. Review and Ask Questions – I look over both of their work to check for mistakes and we make corrections together. I never give him the answers, but I leave it up to him to logically come up with the correct one. With this new routine things have been running a lot smoother after school with homework. What after school routines have you used in your household? 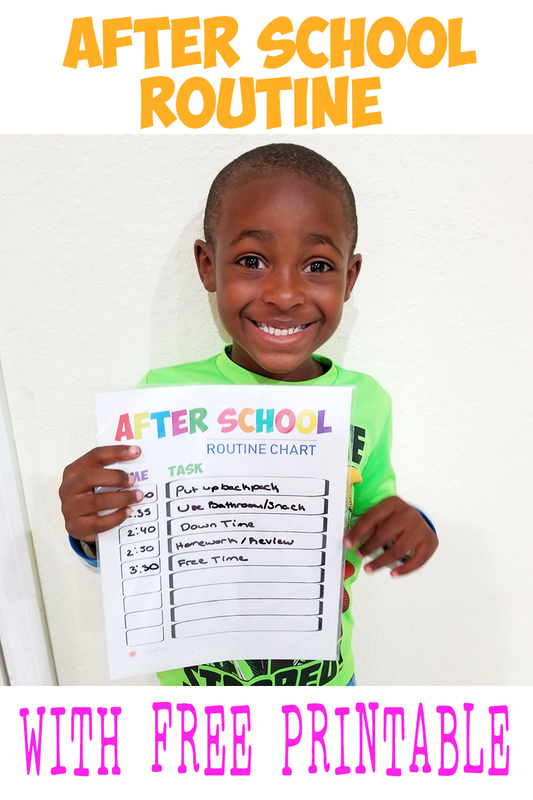 If you need a little help establishing and keeping a routine here is a FREE after school routine chart printable for you! I know that our routine may change some days with appointments or other after school activities, so with this after school routine chart I’m able to customize the chart. Just print it, put it into a paper protector cover and write the daily routine on the outside with a dry erase marker. If you enjoy this printable, please check out my other daily child routine charts printables! 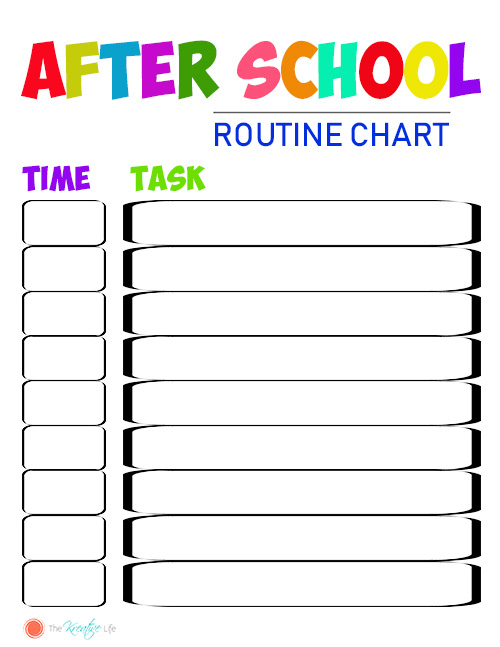 Click on the picture below to download the customizable after school routine chart. As school tips are important ,after school tips are very important as well. Following same routine very good for kids . Thanks for great post.